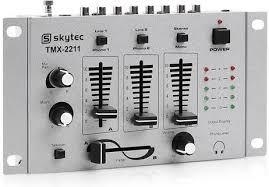 HIGH-PERFORMANCE: The Resident DJ TMX-2211 is an inexpensive and fully functional entry-level DJ mixer. Despite its extremely compact size, the device provides all connection possibilities for a regular DJ setup (CD players, turntables, amplifiers), as well as all major functions (fading, talk over, adjustable headphone volume, VU meters). Clearly arranged buttons, sturdy knobs, and a smooth crossfader guarantee an easy and fuss-free DJ experience.